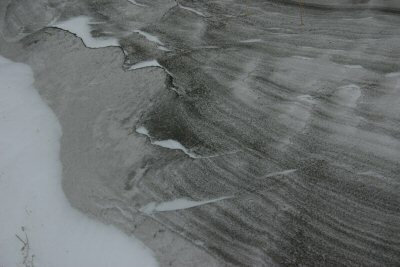 Rain fell throughout the day today, glazing the snow with a coat of ice. No pictures. It wasn't pretty. I am concentrating upon getting things ready before I leave for Tucson for a week. I see that the weather in Tucson is cool, which means sixties during the day. Not bad, but what you really expect out of Tucson is sunshine and 75 degrees in January. The carpenters adjusted strategy and turned their attention indoors, where it appears they will stay for a few days. Next week, temperatures plunge below zero again, so putting on siding wouldn't be pleasant. Just got off the phone with Uncle Rolly. He has two wood stoves of the same sort I have, so he is a good source of advice. He advised me to stuff the thing full of wood--which, when you have a four foot by three foot firebox, is a lot of wood. The boiler water hasn't heated up past 90 degrees, and it is supposed to run at 170 degrees. The water is probably cool because slab is still cold--the main part of it began to be heated only last night--and there is no insulation in the house yet. 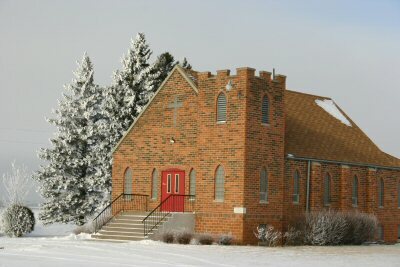 Here is St. John's, the church I drive past several times each day. Today provided natural flocking on the spruce trees. Brian the electrician/plumber got the wood boiler going today. At 3 p.m., without fanfare, I lit a fire in the firebox which immediately fizzled. Brian relit it a few minutes later, and that one fizzled. At that point, we decided to read the directions. We figured out that the damper was off unless you pushed a certain button, at which point, not only did the damper open, but a blower went on which shot smoke out of the chimney as if it were one of those steamers at Rollag. It took a while for me to come up with the word for what I did today. At first, I picked "lathering," but that seemed to apply more to a bath. Finally I decided upon "slathering," which sounds like a good term for applying massive amounts of stain to very rough cut boards which are going to form the corner posts on my house. The project has taken on a little more urgency now that the weather promises to be nice for a few days. The carpenters are keen to get the siding on the house when the weather is tolerable and while we still have the lift. After a bountiful Christmas Eve meal featuring flaming ham, Joe picked up the string bass he is borrowing from the Fertile school for a time and started thumping. We took turns at the piano, with Mom and Joe doing particularly well at making up cabaret versions of old hymns. Eventually, we stood around the piano singing just like a picture out of an ad for EZ Learn piano lessons in Reader's Digest. Gifts: Good books, good socks, some food, home-made note cards, a scarf. Nice things, thoughtful gifts, nothing excessive. Once you get the car warmed up, driving during a cold snap is kind of beautiful. Such was the case last night as I trapsed to Fargo as the sun set. The sun dogs were nearly as bright as the sun. Shopping took two hours. Bought too much, but it's fun. Found myself in downtown Fargo after shopping, needing some food. Wondered where to go. Don't like to eat a long drawn-out sit down meal if I am by myself. Am getting going late on the Christmas shopping. Late in the season, and late in the day. It isn't a big deal because I have in mind what I am going to buy. It is just to go get it all. I don't understand this getting one's gifts in November. The heat is on in the garage of the house. The Kronsch boys are frantically insulating to keep it inside. However, once the wood stove gets hooked up, the house will basically have free heat, so I don't mind a few kilowatts going through the cracks for the next few days if it keeps the guys warm. When the wind turned from south to north last night, it didn't take long for things to cool off. It looks like we're in for a cold snap until at least Christmas. Makes it tough on the carpenters out at the Swamp Castle. They put the garage doors on today. They had the big Nepco heater in there, which took the edge off. Brian, the plumber/heating/electricity man was there as well, getting the boiler ready. Tomorrow, he will fill the floor heat tubes with anti-freeze and water. Later in the week, the woodstove will be filled with about 120 gallons of antifreeze and water. What a day! The wind blew, the temperatures were below zero, and it was cloudy. I drove around the valley running errands, and couldn't resist stopping along the highway to take some shots of the dirt/snow drifts in the ditch.